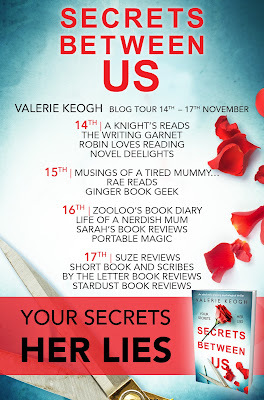 Today is my day on the Blog Tour for Secrets Between Us by Valerie Keough. The letter came every Monday. It was delivered to the reception desk of St Germaine’s school for the Differently Abled sometime during the morning, the postman cycling from the nearby Scottish border town of Peebles, come rain, shine or winter snow. He never complained, delivering the bag of post with a customary smile and wave. In the basement kitchen, which served not only the school but the attached sheltered accommodation, Tia Bradshaw spent the morning as she always did, baking bread from a recipe she had memorised many years before. Occasionally, a new chef –and there had been several over the years –suggested changing the recipe. It always ended in disaster; Tia would start with one recipe but in the middle of mixing the ingredients, she’d forget and revert back to the ingredients from her old memorised recipe. The outcome was usually inedible. The current chef left her to her own devices, making the same bread, morning after morning, never taking a day off, the concept of such a thing beyond her. A previous manager, appalled, had insisted she have at least one morning a week off. ‘You can’t work every morning, Tia,’ she’d said kindly. ‘You need to rest, go for a walk, maybe go into town with one of the staff and do some shopping.’ Tia had looked blankly at her and then, to the manager’s dismay, she’d started to cry. She was one of those rare people who could cry beautifully; fat tears appearing in the corner of her brown eyes, getting fatter and fatter until suddenly they’d overflow and run slowly down her cheeks. She never brushed them away, letting them fall until she was persuaded to stop. The change had been immediate and startling. The tears stopped, and Tia’s usual bland look returned. She was never asked to take a day off again, left alone to live her days as she chose. She always finished her bread-making at two, leaving the last loaves cooling on wire racks for the kitchen staff to put away when they were ready. She usually took her time –she never had anything to rush away for –and sometimes she’d sit and have a cup of tea with the kitchen staff who’d finished their busy lunchtime slot. But on a Monday, as soon as the minute hand reached twelve, she would rush to tear off her apron and run from the kitchen, flour on her face, dough on her hands, leaving a trail of both as she ran along the corridors and up the stairs to the floor where she lived. The housekeeping staff would later mutter Tia! under their breath as they wiped floury handprints from the walls and banister and swept up specks of dried dough from the floor. Sometimes she’d see the letter before she got to her door, a corner of the envelope sticking out. If she wasn’t careful the letter caught when she opened the door, becoming pleated and torn. When this happened, she cried, her tears plopping onto the damaged envelope, rendering it soft and difficult to open. It was best when the administrator sent the envelope sliding across the polished floor to land in the middle of her bedroom, sometimes as far as the opposite wall. She’d open the door, bright eyes full of expectation, and look around the room until she spotted it. She never doubted it would be there, somewhere. In all the years, her sister had never failed her. Taking the precious letter out, she would sit in her chair in front of the window, curling her legs under her, and read every word. Her sister wrote of the everyday things she did, the people she met, boyfriends, lovers, enemies, friends. 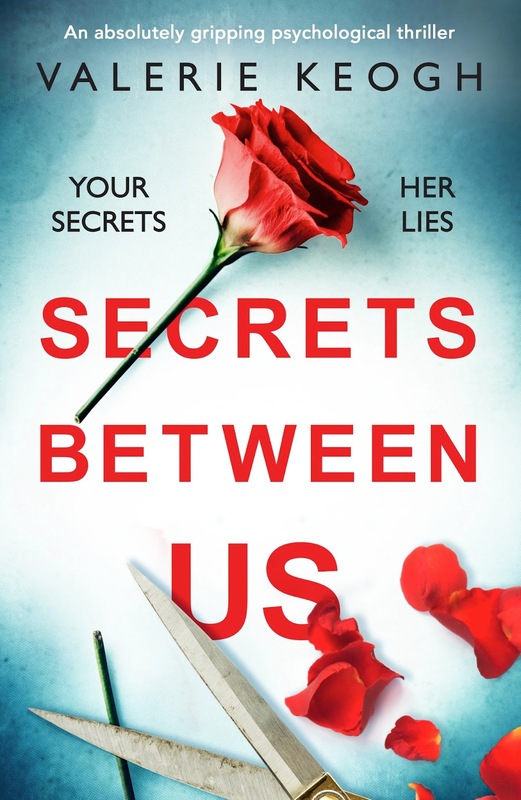 She shared secrets with her, intimate details of her life, a life as different from Tia’s as it was possible to be. In simple, easy-to-read language, she shared everything. At the end of each letter, after signing Your loving sister, Ellie, there would be one final sentence. Don’t forget to burn this after you’ve read it. Tia finished each letter quickly, and would immediately read it again. Sometimes there would be a word she didn’t understand and she’d carefully write it down on a blank piece of paper and head to reception. ‘Can you tell me what this means?’ she’d ask the duty receptionist, handing her the piece of paper. It wasn’t always easy because a word out of context can have many different meanings, but the staff did their best. ‘Thanks,’ Tia would say before heading back to finish the letter, slowly this time, taking in every word. Sometimes, when the letter was long she’d reread it several more times before she was satisfied. And then, almost reluctantly, she’d fold it and head to the administration office. In the beginning, she’d tried to do exactly as Ellie wanted, to burn the letters when she’d finished, becoming inconsolable when she was told she wasn’t allowed. ‘I have to,’ she’d said. Only after several weeks had Tia become reconciled to it. Now, she didn’t think twice. ‘Is it ok if I use the shredder,’ she’d ask, politely. Each time, the staff would smile, nod and point to where the machine sat under the desk. When she was younger, they’d switch it on for her but now they left her to it. Sometimes, if it were someone new on the desk, they’d say she didn’t have to ask. But she always did. And then Tia would wait, patiently, eagerly, for the next letter to come. Every Monday, for fifteen years, the letters came. If Tia had known the word, she would have said that for her sister the letters were cathartic; that in writing them, Ellie released the pent-up frustrations of a woman determined to make it in a tough world. And if for Ellie they were cathartic, for Tia they were fantasy stories about a different reality that she read and enjoyed like a multi-part novel, unfolding a chapter at a time. 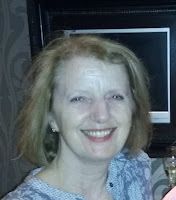 Valerie has also written a stand-alone psychological thriller, Exit Five from Charing Cross.